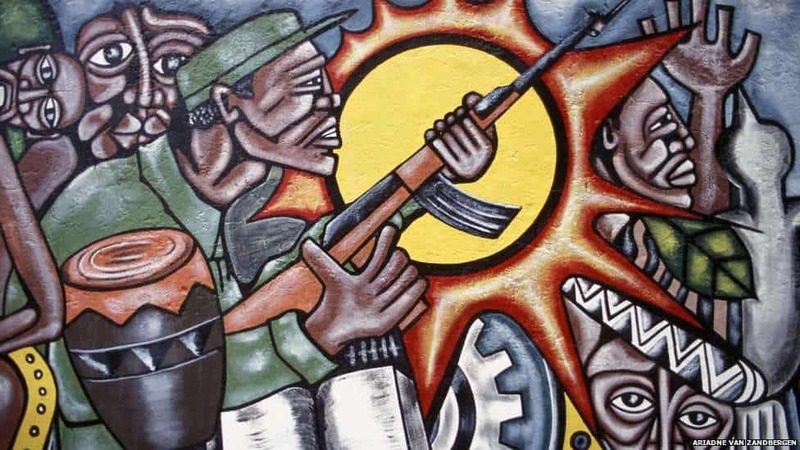 Mozambique in the 1980s was a country in the midst of a bloody civil war, when at least 100,000 people were slaughtered in the span of ten years. 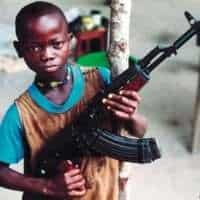 Both sides, FRELIMO, the National Front for the Liberation of Mozambique, and RENAMO, Mozambique National Resistance, used child soldiers. 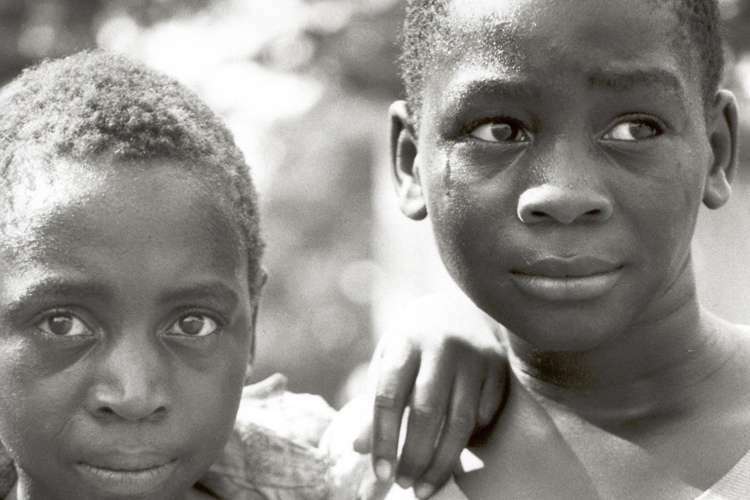 These children, as well as other children who experienced the horrors of war, were severely traumatized and were in dire need of counseling and rehabilitation. Melissa Foelsch Wells, who was then Ambassador to Mozambique, discusses her appearance in the PBS film, “Diplomatic Profiles,” which highlights her work in Mozambique with former child soldiers and her efforts to create a rehabilitation center. She tells the story of one special child, Frenisi, who suffered from severe trauma after he was forced to burn down his own home and his eventual recovery. 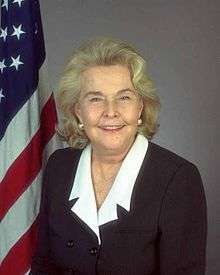 She was interviewed by Ann Miller Morin beginning in April 1991. You can also read Anne Dammarell’s study of PTSD in Foreign Service officers who survived the U.S. Embassy Beirut bombing. Read more about Red Hand Day, February 12, an international effort to stop the use of child soldiers. Q: You said that before you went, you pictured the war in a certain way, and that when you got there, you found that you were wrong. Could you tell me in what way the picture of the war changed when you got there? WELLS: There’s two things here. One is that, for whatever reasons, I was not aware of people traveling as much throughout the country and doing reporting…. I made it my business to travel a great deal, to visit what they call the campos dos deslocados [camps for internally displaced persons or IDPs, who are essentially refugees within their own country] and to talk to them. I talked to people who had availed themselves of amnesty, I talked to people in hospitals, essentially to civilians. Those with amnesty obviously had been carrying weapons before, but essentially [I talked] to civilians, to try to piece together from them what happened, number one, to them. How was this attack? And two, what was their understanding of what this world is all about. There was a deep involvement in terms of the local people and their dissatisfaction with many of the things that FRELIMO did. Why it had to be counteracted [by RENAMO] in such violent fashion and with the use of terror against civilians is another question…. You saw the child combatants, I mean children abducted and trained to kill. Certainly in the case of the children, this was documented by American psychologists who came out there and interviewed and did statistical work with them and worked with them in terms of psychodrama, trying to rehabilitate these children who, at the age of twelve, killed people. Q: Did I understand correctly that the little boy who was mute was asked to set fire to his family’s home and he did it? This is one of many horrible stories. What happened in his case is — and people obviously will be asking, if he’s mute, how do we know the story? And I’ll get to that in a moment. But his story is that he went down to fetch water by the pond…. He came back to their hut and there were men with guns surrounding it. Then they told him to set fire to the hut. They gave him a torch. 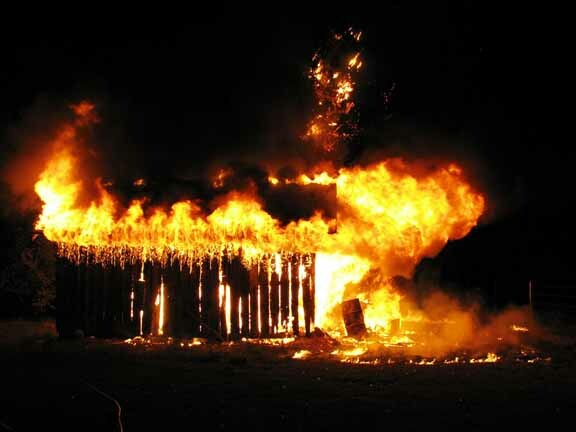 Of course, the hut is what you call a palhota, a thatched roof and so forth, so that the thing went up in flames. Immediately the parents came running out and then their heads were cut off. There are other gory parts to the whole thing. You see, when Frenisi came to us at the Lhanguene center [the home for traumatized children], I remember I reached out for him, because I used to go there several times a week to be with these children, and he just wouldn’t speak to anybody, wouldn’t speak to the other children, nothing. He would just always be off by himself. He would not participate in any of the activities. He’d be off in a corner, and then from time to time tears would pour from his eyes. I remember I’d go there with ice cream and Coca-Colas and with Donald Duck cartoons, and I remember taking him and putting him on my lap, and he was like a little sack. “Okay, she wants to hold me.” I mean, I tried to cuddle him and so forth, but just no reaction whatsoever, except sometimes he cried. Eventually the story came out via drawings, because the way Dr. Boothby would draw the stories out from the children was by asking them to draw. Frenisi did participate in this eventually because there were bright colors and papers and things that at first he wouldn’t have anything to do with. He was simply asked, because nobody knew his story. He was there for months on end, and nobody knew. We knew something must have happened which was horrible, but we didn’t understand why he didn’t talk to anybody. He was asked to draw his home, and Dr. Boothby has that drawing, the first drawing. He said, “You know, any person with minimal training in psychology, especially child psychology, can see that this child has a deep problem.” At this stage, as I recall, the whole violence aspect hadn’t even come into it. So he drew him out and he asked him to draw this part and to draw that part, and then the whole story came out. The reason he wasn’t speaking was because he felt guilty. Because in his little six-year-old mind, he was the one who killed his parents because he set fire to the thing. I was there when they reenacted the psychodrama, which is where the other children who’ve all had brutal experiences as well play different parts, and little Frenisi is sitting, watching. He watches a little boy playing his part and they reenact the story according to Frenisi, with killings and so forth. Frenisi sees that that there is nothing he could have done. To you, to me, hearing the story we arrive at an immediate conclusion that he was forced to do it. But Frenisi had never clicked on that. He was just beset with rage and guilt that he was responsible for the death of his parents. WELLS: She died before I left the hospital. She was not just moaning. I mean, she was unconscious, but there were sounds coming out of her mouth. I can tell you here — I couldn’t do it on the film — that I believe in God, and what I was doing there was just holding onto her and praying and giving strength for whatever the future held, and the future held that she was dead before we left the hospital. And she was in a very good hospital. Remember that we’re traveling with a camera crew and sound equipment and so forth. When I was traveling by myself, I didn’t take extraordinary risks, but with this whole gang I just did a quick and easy visit to a hospital in a war zone that was fairly close to us, as opposed to some of the areas that I was asked to go to in very difficult areas, but where I would never dream of taking other people along. Certainly people from my embassy, possibly, but not the camera crew. I started [Lhanguene, the home for traumatized children]. I got the U.S. Government to fund this project. We had to have a place for the children and the government made that available. We had to get it fit to live in…. But then the key thing was to bring the specialized talent from the States. First we had a child psychiatrist and a psychiatric social worker who came over and who did the first cut in terms of interviewing the children that were in that place at that time. Then later on, a few months later, once the idea was developed into a project, because we didn’t know what to do. What do you do with children who have been taught to bayonet and to kill? Do you just treat them like any other twelve-year-old, or do you put them in prison? Or do you “warehouse” them, you know, because they’re unsafe for society? These were issues that had to be discussed. 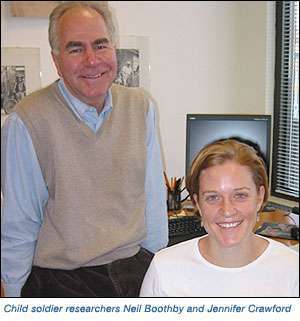 Dr. Neil Boothby from Duke University is a very well-known child psychologist who has worked in Southeast Asia and in Central America, and particularly with this problem of children and violence. 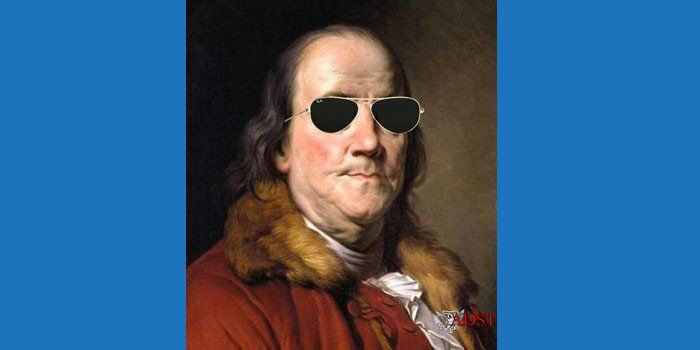 The whole project was implemented under Save the Children Federation of the U.S.
Q: Who put up the original money? WELLS: The U.S. Government. Then the project acted as a lead for Save the Children, U.K., for Redd Barna [“Save the Children”] from Norway and for various others. 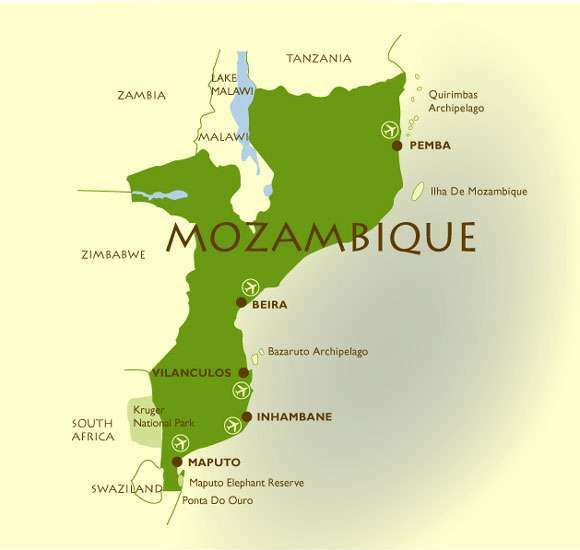 The idea was to develop a training model, because at that stage there was not one trained psychologist or psychiatrist in all of Mozambique. They had to rely on outside talent. Obviously these people are still in training and sometime will qualify, but we can’t wait that long. PTSD, as it’s known, didn’t even exist in World War II. I understand that some people in the world still question whether it exists or not. But certainly in the U.S. we recognize it as a real problem. Many of our Vietnam veterans have suffered and are still suffering from it, everything from nightmares to aggressive behavior, many symptoms. But how to assess it, how to draw out the child and then how to deal with it in the psychodrama? Then in addition to that, we got into the question of reuniting the children with families, if you can find them. By the time I left Mozambique, we had reunited 2,000 children — 2,000 — in a country at war, where people can’t read, where they have not even seen a photograph of a loved one. We managed to track down the families. I won’t always say the parents, because often the parents are killed or we just don’t know…. This was another interesting part of the process because they didn’t all immediately say yes. They thought about it; they thought about it…. What we did was, because as we found homes for more and more children, the few that were left, it was very sad because they had bonded together as a group and now they’re all going off. Q: This was the child who was mute? Frenisi was beginning to learn Portuguese at this point, because before that he didn’t speak Portuguese. “He’s new here. He doesn’t talk very much.” And it was as if he was looking at me and saying, “I know you know me from when I didn’t talk at all.” [Laughter] But he was now in charge of this other little one. Trying to help him, but making sure that everybody knew that he was helping him. Anyway, he’s with the family. We found family for the best friend that Frenisi had at the hostel, and we approached his family to say, “The two boys were so close. We cannot find any trace of Frenisi’s family, even in the extended concept of the African family. Will you agree to take him?” And this is the wonderful thing about Africa and its concept of what a family is. They are very poor people and they said, yes, they would. Q: These children who were abducted, is this because the rebels want to raise their own recruits? WELLS: I don’t know the reasons for that. The study that was done, based on dozens and dozens of interviews with children, and I’ve read it….It’s difficult to understand. What do they want these little children for? Well, many of the littler ones, you know, collected firewood, collected water, did chores around the camp. But there were others, stronger ones, the bigger ones, who became part of that whole [guerrilla] concept. They wanted to be one of the big boys and they could become even more brutal. They were trying to outdo each other in terms of brutality. Q: You visited Lhanguene once a week? WELLS: In the early days, at least once a week, if not more. I’d go over there every weekend…. I was overwhelmed with these children and their problems. While we were putting the project together, and then when the first team came, the child psychologist and psychiatric social worker, I was there for most of the interviews. I just wanted this thing to work. I mean, I gave a lot of my time because, quite honestly, you can’t just handle it in a bureaucratic way. It wouldn’t work. It wouldn’t fit. You see, we’re used to emergency programs where we send food, we send medical supplies, tents, blankets, you name it. But “shrinks”? That’s something else…. The approach that prevailed, of course, is totally different in terms of the future. Children can be rehabilitated. Some of them are damaged for the rest of their lives, obviously. Children have been reunited. One of the ringleaders who admitted in his interviews that he can remember killing six people, at least — I mean, bayonets, whatever — has gone back to live with his uncle. In his case, it was particularly sad because when they located the family, the family didn’t want him. I won’t say they didn’t want him; they were not thrilled with bringing him back because they were afraid that they would get retribution from their neighbors because he was involved in killing, you see. He’d been seen in attacks. We tend to forget, and this is so interesting when you get inside Africa, when you get out of the cities and into the bush and into the villages, how perceptive the people are, how they communicate with no electronic equipment at all. That bush telegraph — and that’s not just Mozambique, it’s happened to me in other parts of Africa. It’s incredible how it works. They know what’s going on. WELLS: Yes….I’ve been in touch here in Washington to see what can be done in a more organized fashion for the “children of war.” I’m not talking just about immunization and food and so forth, because that’s a tremendous problem, but there are so many people focusing on that as opposed to the psychological damage. It’s not just the Mozambique experience; it’s the Uganda experience before that, where they had the kidogos – again, child soldiers. We know that it certainly went on in Cambodia. These are people who are alive and they are the adults of tomorrow. They’re carrying this stuff around in their heads, and we have to cope with it. We can’t just lock them up. We can’t just turn them loose, either, turn them loose without talking to them, without trying to relieve them of guilt feelings, which is essentially what our program does. It has to be focused, done in a more organized fashion.